I grew up near the water, in a town which was built around artificial waterways. Sailboats were plentiful and, in fact, every year on the fourth of July, everyone who had a boat could be found floating in the Central Park lagoon watching the firework display directly overhead... Definitely the best seats in the house!! My folks weren't really into "outdoorsy" activities. Therefore, in the boating department, we were among the "have-nots." I attempted Windsurfing, to no avail (it somehow lacked the comforts that I craved while afloat), then bought a couple of cheap Inflatables, which were far more fun when towed behind a boat with a motor! I purchased Aesop for the outlandish price of $50.00. 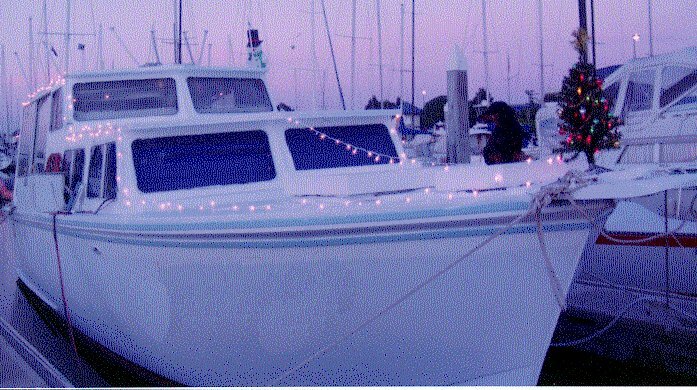 Then proceeded to put an additional $350.00 into making it seaworthy (this was my first exposure to the phrase "A boat is a hole in the water that you pour money into." It is now my mantra!). Aesop is a 12-foot Snark sailing dinghy. Old, and square and rugged... Kinda like an old Volvo. Looks like sh**, sails slow, but forgiving as hell! I couldn't have hoped for a better "Training boat." Well, when I decide I like something, I tend to go a little bit overboard (no pun intended). Next thing I knew, I was up to three sailboats, ranging from 12 to 16 feet, and two inflatables, 7 and 9 feet. I believe I actually qualified as a Navy in our town so you'd think that would be enough, right?! Real Estate prices in the Bay Area are exhorbitant, to say the least. Rents are going up all the time, and it is getting increasingly difficult to find apartments that will accept pets. The boat was the perfect solution for me. Although, I agonized over the idea for quite some time before "taking the plunge"
I am pleased to say that this was probably the BEST decision I have ever made. The dogs grew to love it (after a few minor incidents of seasickness, and a couple of unplanned swims!). I went through about two weeks of vertigo, but now I find that my boat, my home, is the best place on earth! I like nothing more than to "park my troubles at the gate" and walk into my sanctuary. I can sit in the salon for hours, watching the seabirds fly by. In the spring, we have ducklings. Early summer, we have coots. In the late summer, we have indescribably graceful cranes (who leave indescribable messes on the docks, but that's another story!!!). We even get to see the occasional harbor seal! There is something very soothing about being surrounded by water. I don't feel nearly as much stress as I used to. I feel somewhat detached from the rest of the world, which can be a good thing. While there are other liveaboards nearby, most boat-dwellers seem to do an excellent job of respecting each others' need for privacy. I can listen to music, play my keyboard, and meditate in total solitude. And sleep? My GOD, you have never experienced true, deep sleep until you have slept on a boat! Tartan is one mean, testosterone-pumping, fishing machine. This boat has MALE written all over it, and I totally love it! Built in the late 60's, everything is original and I really doubt that I'll change anything (at least not until I can finish winterizing Solitaire!) I plan to continue living on Solitaire, and reserve Tartan for play. Hell, it's STILL cheaper than rent! A "Reality Check" for anyone considering this lifestyle Plus some boating links!